Like a crook hiding something, like a sinner who couldn’t look up. A witness moved but not moving, unacceptably still. Peeking at the tips of leaves. And now, hey-ho, here comes 2015’s imperative New Year post. And, as usual, my entry’s a tad bit too late for the annual jumpstart-the-year-with-this essay writing contest. And I’m saying that just to point it out already before anyone else calls it out on me. Done deal, whooped my own behind for it, and i’m fine anyway, still writing, so either you judge me because of writing the year’s first entry halfway into January or you just go on and read whatever follows this sentence and send me a virtual high five. If you’re still reading this, *high five*. Two thousand and fifteen. This year feels different, says everyone every time the year changes. Maybe pointing it out might increase the possibility of the actualization of aspired change. Might give some push, might instill a stronger sense of optimism and faith, might finally actually convince the self to make things happen. For me, it’s different because this year came without that profound feeling worth a word and hundreds more. What it came with was an itch that crept from the center of my palms to the crook of my elbows, and badgered at my neck so that when I craned and stretched and shook off the crumbs of 2014 from dreams and memories stuck to my hair, I am left champing at the bit to manufacture moments that will incite desired profundity rather than wait for it to be shed from some speeding meteorite one fateful evening or so. The above-mentioned continuous weeks of drinking anticipated for 2014 did materialize and resulted to a majority of the year’s nights, or dawns more precisely, of falling into bed too intoxicated to remember anything (more so write about) and waking up too late to do anything else but rush to work. Entire days were either spent fulfilling whatever waits at my desk or figuring out how to even achieve fulfilling whatever task is at hand. The days and nights endured. I turned to one frivolous evening after the other in a frantic search for joy that only seemed to elude me more as I craved it. Until I allowed the torture of isolation to wash over me. I took to the cliche and on one night I sat alone in a bar, dim and smoky and bleeding with soul-gripping music that too few people listened to, one hand grasping a glass of whisky for dear life while gripping emptiness with the other. The night aged and changed and gave birth to the kind of bliss brought forth by the virtue of choice. It was deep and real and unbreakable exactly because it was how it ought to be, it was what it was though unexpected, though unplanned. At the oddest of circumstances, in quiet solitude, I had finally chosen to be happy and I knew I was. Still am. The past year failed to live up to plans and realize illusions I conjured in blind hopes of keeping my life together. Instead, it painted a picture that though seemed unlikely was definitely a deliberate stroke of the one who paints things greater than this little dot inside this tiny little frame. 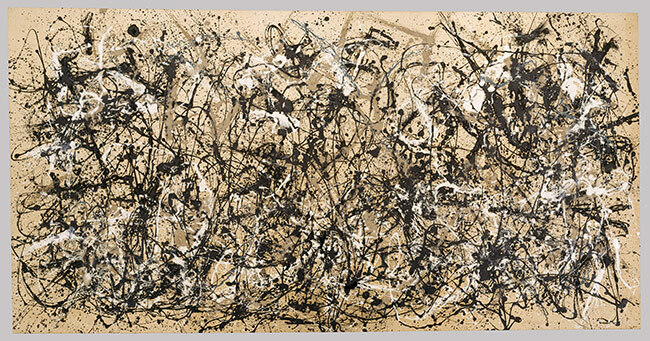 Autumn Rhythm feels like the best appropriation, certainly: drip painting, Pollock, autumn, rhythm, the number 30, and the great immense enlightenment culled out of a certain feeling of meaninglessness. The past year saw a lot of things planned but unrealized. Long lists of wants and should-haves and could-haves crumpled and tossed away. I would have been so utterly disappointed, endlessly scolding myself for failing to living up to a set of to-dos and habits and traditions and expectations I certainly should not deviate from. But then it was also a year of realizing that plans? Pssshh, they’re not all that. Really. In the past year, what I learned is that the things that will happen by virtue of being the other scenario that fate had intended for you at that moment will be as important as every other thing you had planned or intended or even mildly hoped for. But you must allow it to become that. You must live in that moment as it is and open yourself to its impact rather than getting hung up on what was replaced and failing to even notice what has taken its place instead. Only if we allow these moments its being will we truly enjoy our every waking breath. Only then will we understand what it means to live life fully – to allow it to happen as it would by letting it happen as it does and not necessarily always according to how we had hoped for or planned. I have still made plans for this year, more detailed than that of the past year in fact. The difference now is that I know I no longer have to kill myself over boxes left without check marks or standards that may be unmet. Simply put, I am going to rediscover the wonder of being surprised again. And I will learn to surrender myself to the thrill of it. Last year I yearned for things to make sense. Indeed, it is starting to make much more sense in ways I have not realized before. And, yes, finally the feelings and choices and even non-choices have begun to matter so much more. It all will once you think of the moments you’ve lived rather than the time you’ve lost. And sleep? Though there is so much delight in being wide-eyed and fully awake for as long as you can muster to be in a day, I am glad to have begun reacquainting myself with the dreams under my pillow once again.